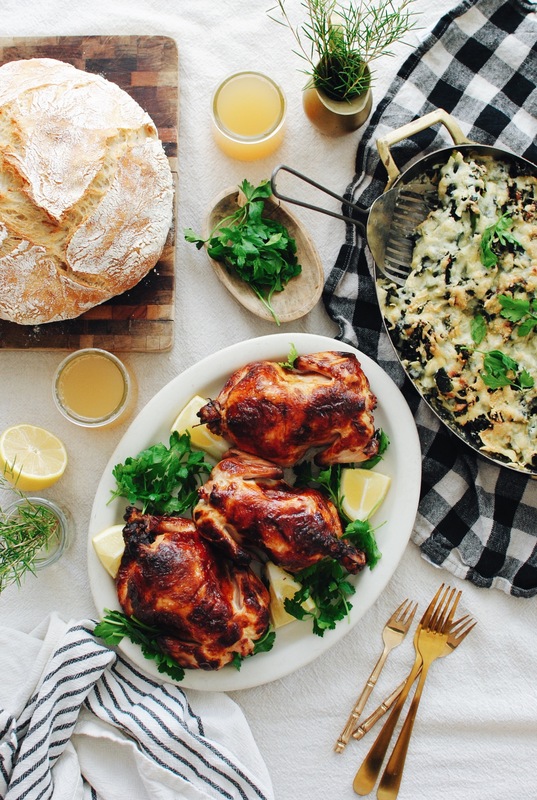 Another Valentine’s Day meal that I’m forcing upon you! Also, these hens are upside down. I’m just getting this out of the way right here, right now. I roasted them upside down. You may now kick me out of the blogosphere and life. And I did it again. But this time, never even realized they were upside down. That is, until Aaron cut into his and said, “Whoa okay. The breast meat is on the bottom.” AND MY BODY WENT COLD. Couldn’t believe it. You’ve got to be freaking kidding me. I roasted these dad gum mother babies up.side.down. So now that I’ve gotten that out of the way, let’s get through the rest of this meal, because it truly is FANTASTIC, and I need you to need it and I want you to want it. So these hennies go back on a rack, and you’ll re-salt, inside and out. Like, I can barely look at this. Upside down. Look at what that buttermilk does, though! No BUTTER, no OIL, no NUTTIN’. Can you how imagine just how stunning the breasts would have been? Dying. Okay, so this is what 20 oz of chopped and sautéed lacinato kale looks like. With garlic. Two 10 oz bag from TJ’s! If you want, you can absolutely chop up two bunches of kale, and remove the thick stems at the bottom. I used the bags because life. 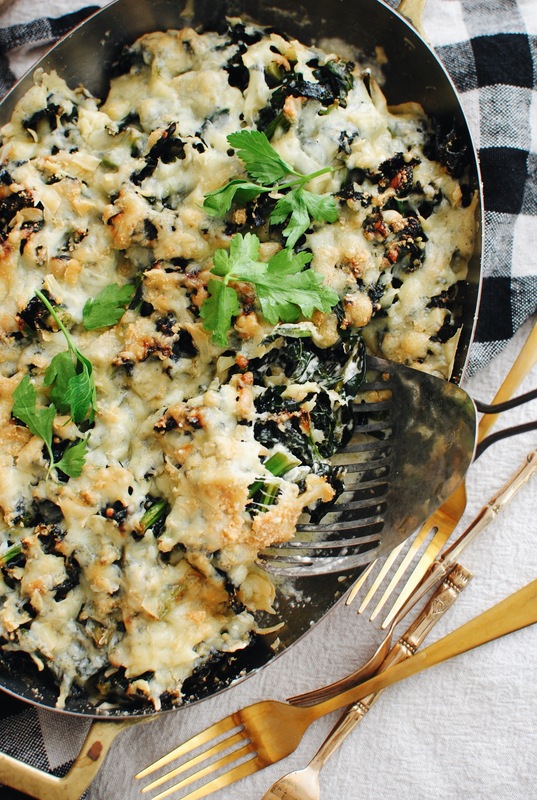 Transfer the kale to a gratin (or any baking dish!) and drizzle heavy cream with nutmeg over it. Took a cup and a half to make my heart lose its mind. Then sprinkle it with grated gruyere (or honestly, a white cheddar would do!) and parmesan cheese on top. While the hens REST, you can stick this gal in the oven for about 25 and get her super succulent. I MEAN THEY ARE PRETTY. Even upside down. And the flavor? Lemony! Rich! TENDER and moi- um, you know. And that buttermilk skin is going to have you punching yourself in the face. And the gratin! It’s just unreal. Garlicky, creamy, so rich and indulgent. And let me say, if you don’t make this for V-day – EASTER would be perfect. Dude, even Thanksgiving. It is so beyond, you simply have to make it for SOMETHING soon. Sunday night dinner. A nice dinner party where you need to bring a fancy side. THIS. Did I mention it’s painfully delicious? And the bread, it’s Bittman’s no-knead bread I make constantly. If you want to add cheese to it (which you do), I have this fab version! Evenly and heavily salt each cornish game hen, inside and out, and place them in a large plastic bag. 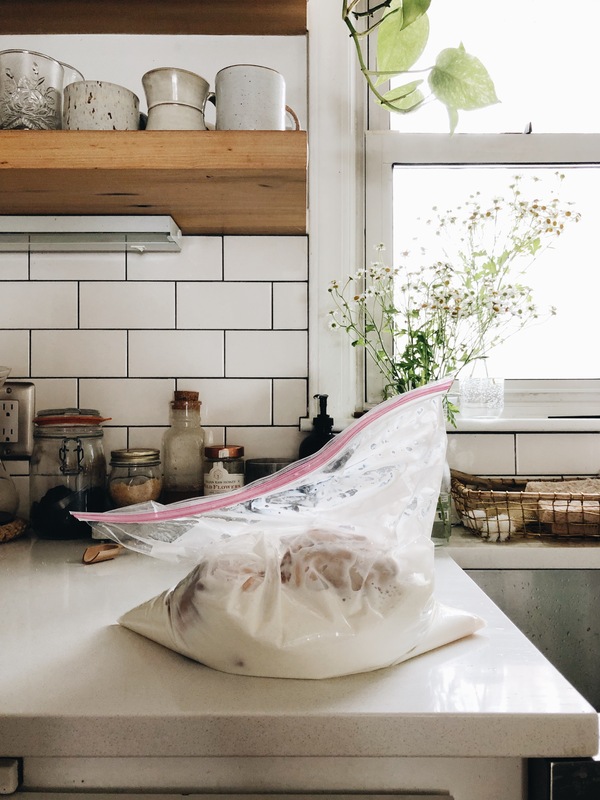 Pour the buttermilk into the bag until it covers the hens. Seal the bag and marinate in the fridge overnight. Next day, remove the hens from the bag and pour off the marinade. Let them sit on the counter for about an hour, letting them come back to room temperature. No need to pat dry! Place them on a rack that’s placed on a baking (or roasting) sheet. 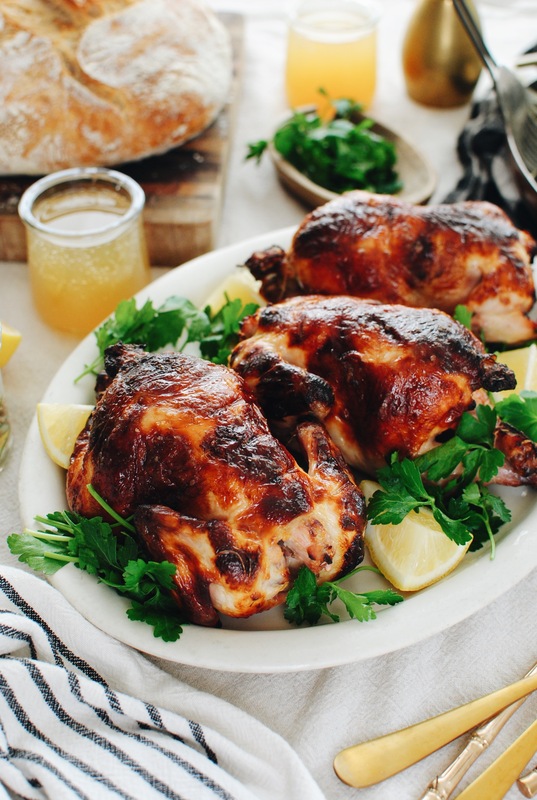 Place a garlic clove and a lemon wedge inside each hen, and evenly salt the outsides again on both sides. 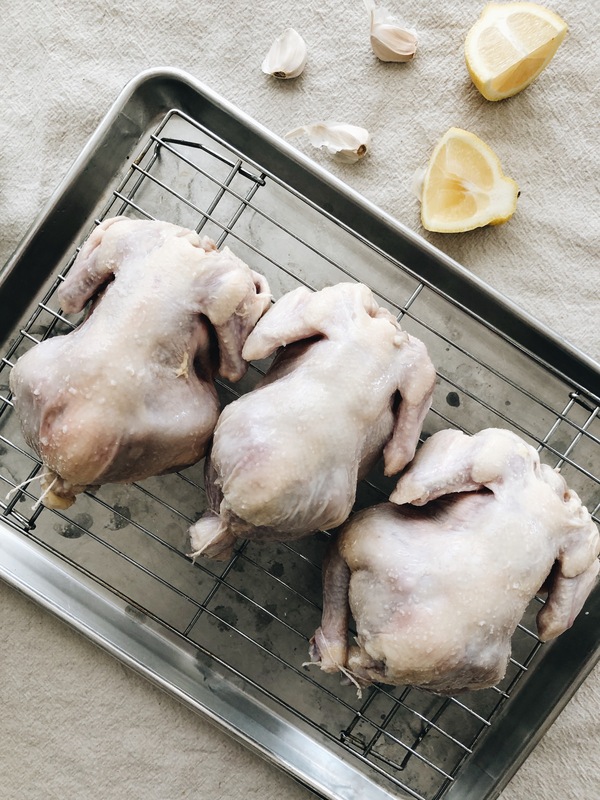 Tie the little legs with twine, and roast the hens breast side up (still in disbelief) for 50 minutes to an hour, until the chicken reaches 165 in the leg. Look how gorgeous they are! If you need to move the pan around mid-roast, do it for even browning. 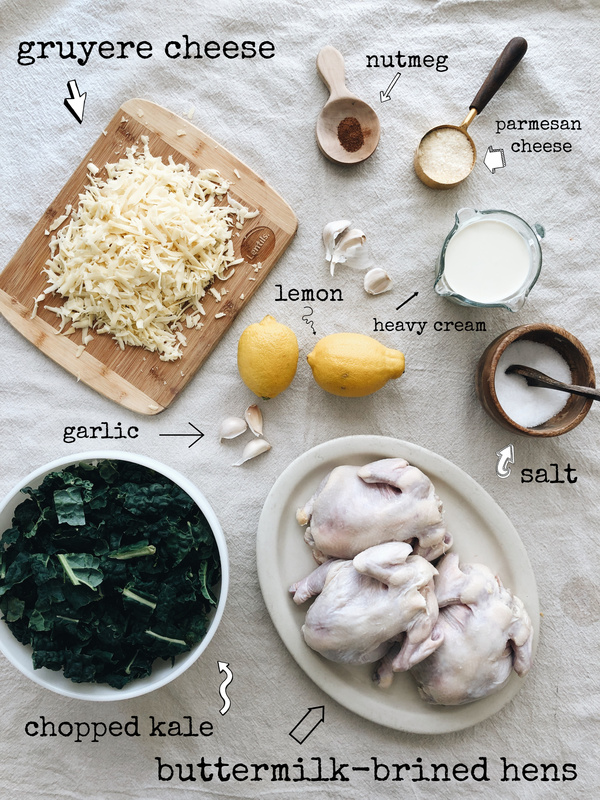 While the hens roast, make the gratin! Mince 3-4 garlic cloves, and stir the nutmeg into the cream. Heat a Tbs. 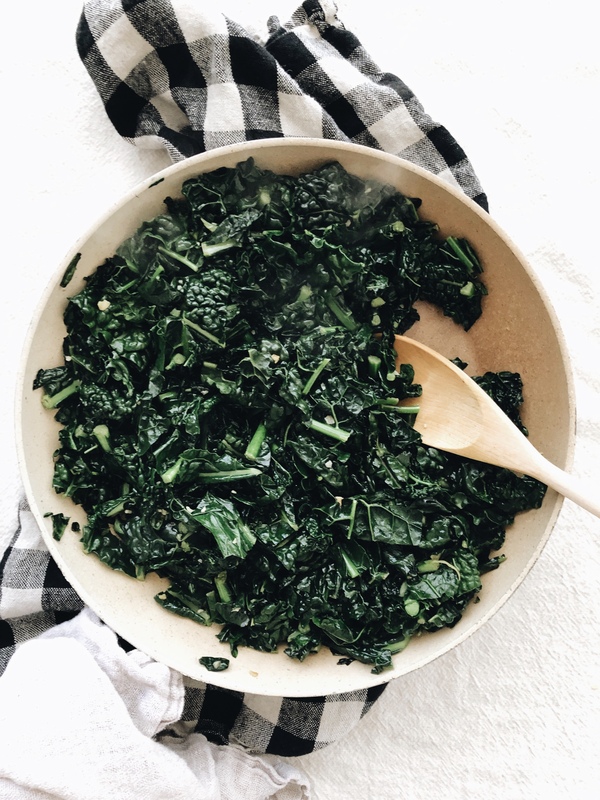 of oil in a large sauté pan, and in batches, sauté the kale until all 20 oz are wilted. Season with a pinch of salt. 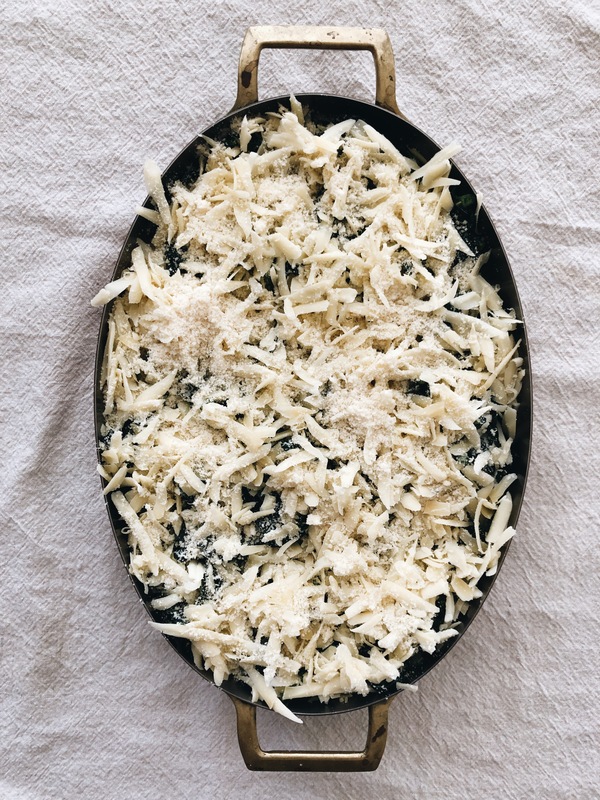 Transfer the kale to a gratin (or baking) dish, and pour the heavy cream over the kale. Sprinkle the gruyere and parmesan over the top. Once the hens are out, covered and resting, slide the gratin into the oven (still at 425!) and bake about 25 minutes, or until the cheese is melted and the parmesan is browning. 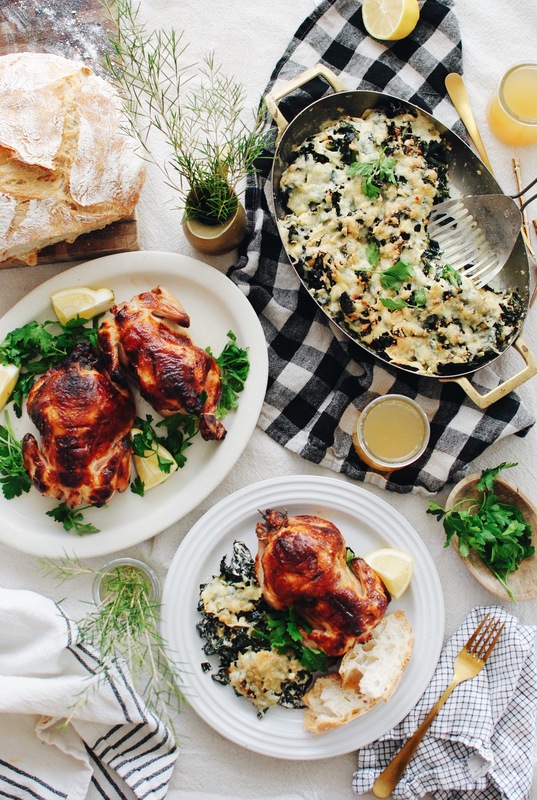 Serve the hens with the kale gratin and the crusty bread! UPSIDE DOWN. I am just completely dying. UGH ok so the milk I was using probably WAS bad if it was chunky. So weird!!! Thanks!! Now I get you didn't mean to roast them upside down; I always have to check my turkey too, to make sure it's breast side up and it's not that obvious!! But anyway, some people roast upside down in order to keep the breast more moist. So just go with it! Bet it was delicious! I have read lots of recipes/theories on roasting chicken and turkey upside down to keep the breast meet from drying out so.......good idea? This looks outstanding! 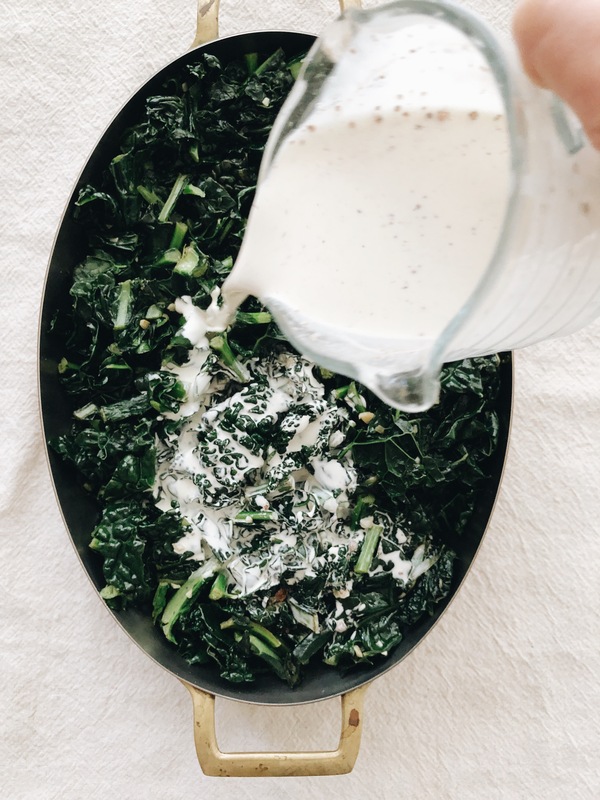 I would never drink buttermilk but you are absolutely right about what it does for food. 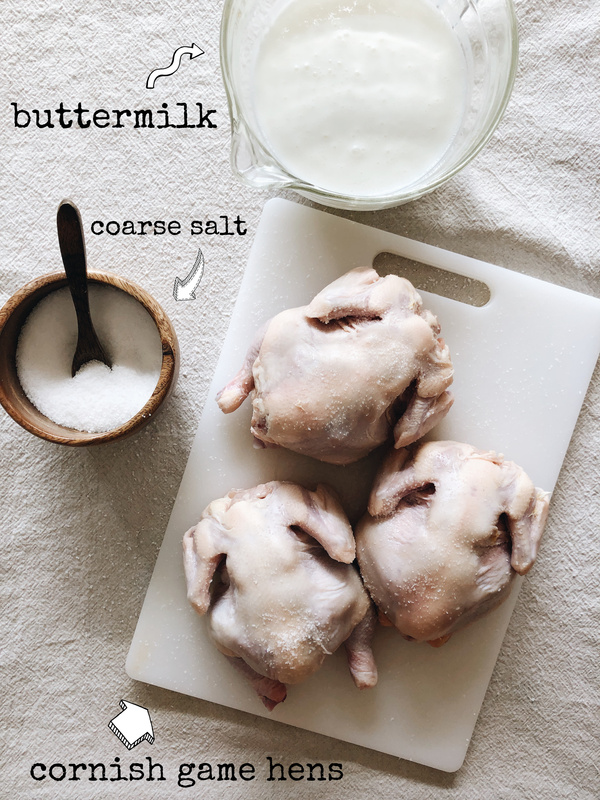 I keep some around almost all the time for biscuits (SO much better than recipes that use regular milk), homemade ranch dressing, muffins, cakes (yes, I'm a bakeaholic) and I love it to marinate chicken in it. 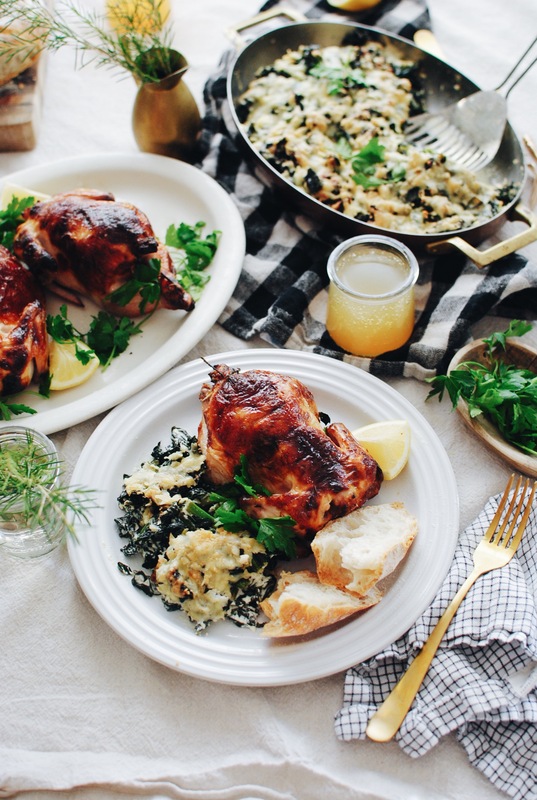 I'm going to try once again to find Cornish hens in my local stores so I can try your idea on Cornish hens. It's not like I live in a remote or small town, it's the dang capital of the state but all of a sudden no stores carry them anymore. And when I ask about them, most of the employees look at me with a WTH look, like they've never heard of the tiny little chicken things. If you hadn't said anything I wouldn't have noticed!! 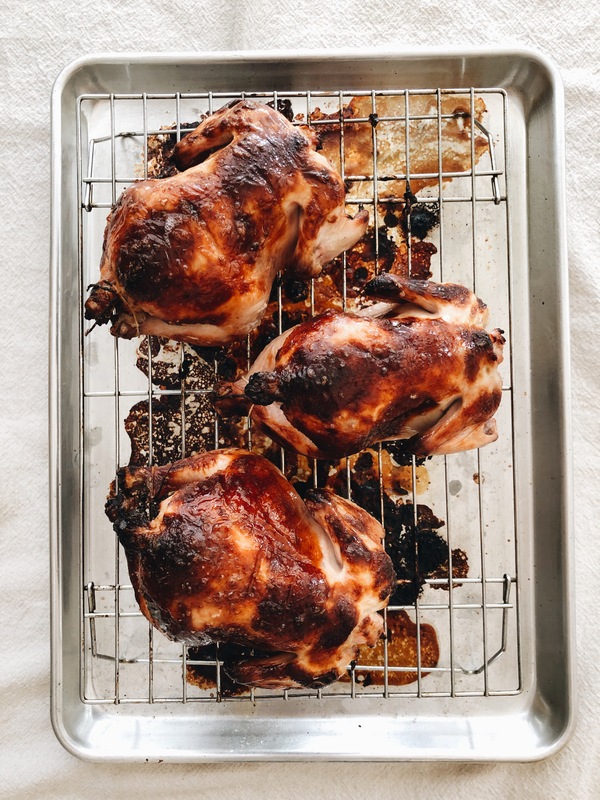 I roasted a chicken upside down one time and the meat was so juicy and tender! Definitely not a bad thing!! This looks amazing and buttermilk woohoo! !